If not taken care of, ice dams can lead to serious water damage in your home or building. Remove snow from your roof after every storm: Use a roof rake to clear the first three to four feet of snow from your roof immediately after each winter storm to prevent ice dams from forming. While the amount of snow and ice that your roof can handle may vary depending on a number of factors such as the roof type, age, and condition of the structure, a good rule of thumb is if there is more than a foot of heavy, wet snow and ice on your roof, you should try to have it removed. Clear downspouts: An easy way to help snow and ice drain off your roof is to make sure the area around your downspouts is clear. This will make it possible for your gutters to drain when snow does melt. It will also help prevent flooding when the snow and ice melts. 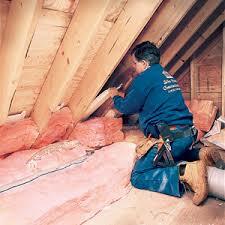 Insulate your attic. 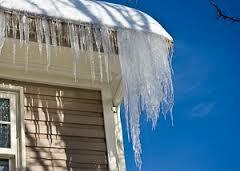 Make sure your attic is well insulated to help prevent the melting and freezing cycle that causes ice dams to form. Check and seal places where warm air could leak from your house to the attic, including vent pipes, exhaust fans, chimneys, attic hatches and light fixtures. However, make sure not to cover soffit vents. This is important because ventilation is necessary and if the vents are covered you risk the chance of microbial growth/mold. Another method is to fill a nylon stocking with calcium chloride ice melt and place it vertically across the ice dam so that it melts a channel through the dam. If you try this method, make sure you can safely position the ice melt on your roof, and make sure to use calcium chloride, not rock salt. Rock salt will damage your roof. Also, be aware that shrubbery and plantings near the gutter or downspout may be damaged. 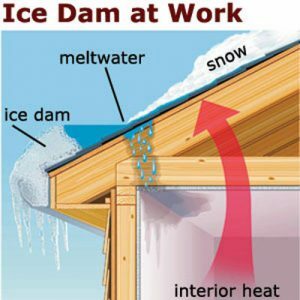 In regard to insurance water damage claims generated from ice dams, you should be aware that property owners are responsible for the cost of preventive maintenance. However, each claim is unique, and coverage and claim decisions always require an expert analysis by a licensed claim professional. 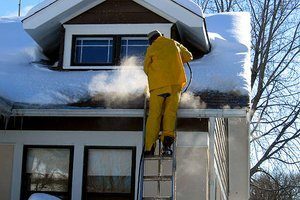 Keep in mind that the cost of snow removal is likely to be considerably less than the cost of roof damage or interior property damage caused by water leaks.